The Ameriglo Combative Application Pistol (CAP) sight is a high visibility sight system designed for any type of situation one may encounter whether near or far. 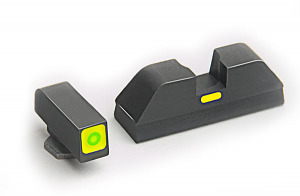 The rear sight features a flat-black classic rear with a lumi-lime horizontal line. The front sight features a tritum sight with a lumi-lime outline. The CAP sight is a "cover point of impact" sight in which the shooter covers what they want to hit. Designed with input from some of the industries leading trainers, gunsmiths, and end-users such as Dave Spaulding, Kyle Defoor, Ken Hackathorn, Pete Milionis, David Bowie, and John Krupa, the CAP sight system is a great choice for all applications. Fits Glock 17,19,22,23,24,26,27,33,34,35,37,38,39.